I’m a big fan of innovative skin treatments, but so far everything I’ve tried has been stuff that goes on top of the skin. So what happens if you take some of your favourite skincare ingredients and put them in edible format? Can skincare you eat compare to skincare you apply? Help: beautify skin is a new ready-to-eat jelly supplement that looks and tastes like a sweet snack but is designed to improve your skin from within. It’s part of a range of skin supplements from Works With Water, a new UK brand born and bred in Lancashire. (They should totally do a Lancashire hotpot flavour BTW). Help: beautify skin jelly supplements are free from artificial colours and flavours. Each 10g sachet contains natural skin regenerating nutrients including CoEnzymeQ10, Hydrolysed Marine Collagen, Resveratrol, Aloe Vera and Vitamin C – recognise any of those from your skincare? I was sent two boxes for this review by Works With Water. Each box contains 14 jelly sachets, with the advised dosage given as 1-2 sachets per day. I took one sachet every day and a second one when I remembered, so the 28 sachets took me around 6 weeks to get through. The gels are apple flavour; quite sweet and pleasant tasting. No need to eat them with food – the brand name Works With Water refers to the fact that its products work within the water in our bodies. For me, yes it did. I definitely had more of a glow and better skin texture by the end of the six weeks. I couldn’t detect any difference in my nails, but my skin was definitely feeling the benefit. I took some pictures and whilst I don’t think there is enough of a before and after difference to show you, in real life I could definitely tell that Things Had Improved. I really liked the convenience of this product. If I want to do a face mask, I have to wait until there’s no one around to laugh and point at my Shrek face, but with this you can just eat it at your desk and get a skin boost in about 5 seconds. I know in theory that we should be getting the nutrients our skin needs from our food, in the real world most people don’t live like that all of the time. So this is where I think products like this are beneficial, for an extra easy boost. At around £23 per box, whilst this isn’t the highest priced product in the world, I don’t think most people’s budget would stretch to taking it every day. Where I think it really has benefit is if you’re working towards a particular event that you want to look your best for – say a wedding, holiday or meet up with people you haven’t seen for 10 years. If you’ve been a bit run down and your skin is showing it and needs an extra boost, this would be perfect. I can also see a benefit for people with ultra-sensitive skin that gets easily irritated – it’s a much easier way to boost your skin from within. Help: beautify skin is available here on the Works With Water site. 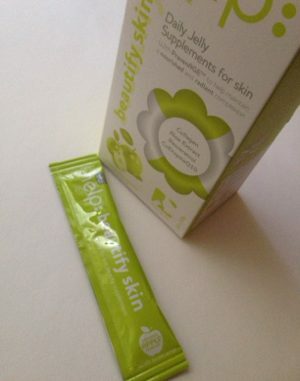 What do you think, would you try a skin supplement like this?